Dublin Airport is a gateway of prime importance to the island of Ireland. It serves incoming and outgoing commercial passenger and freight travel as well as incoming and outgoing tourist and leisure passenger travel. It is of high level importance to the Irish economy and to Irish society. Currently, aviation fuel supplies for Dublin Airport are transported from Dublin Port to Dublin Airport via road tankers. The proposed new aviation fuel pipeline is designed to replace the existing road delivery system. Fuel will be pumped from existing tanks within the Port via a new inlet station direct to a new reception station where the pipeline will terminate. The fuel will be stored in storage tanks at Dublin Airport. The pipeline will remove over 15,000 fuel tankers each year from public roads (at current demands). It will reduce CO2 emissions by at least 500 Tonnes per annum. The pipeline will provide a sustainable and secure means of fuel supply for Dublin Airport. 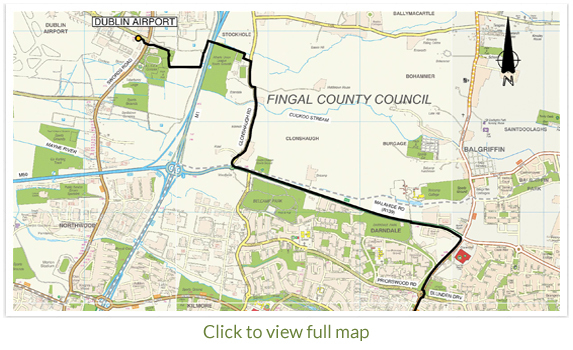 Address: Aviation Fuel Pipeline, Bridge St Centre, Portlaoise, Co Laois.